The product division of Wire, Cable, & Accessories, contains everything needed for the transmission of electrical signals as well as everything needed to organize and manage cable assemblies. 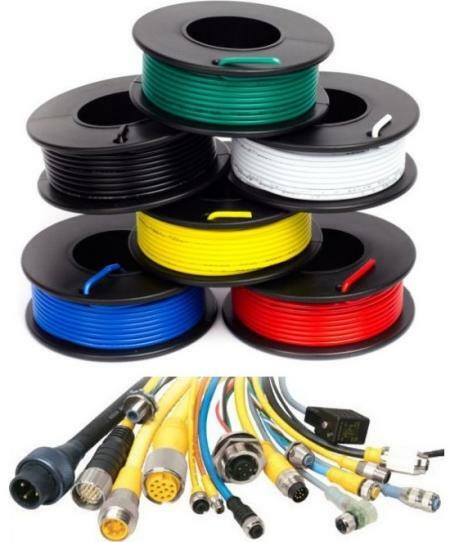 We stock an expansive assortment of hook up wire, control & tray cable, variable frequency drive (vfd) cable, bus bar, ground straps, ground bars & accessories, ethernet cable, cable glands, cord grips, strain relief, cable ties, ferrules, lugs, crimping, cutting, & stripping tools, power distribution blocks, heat shrink tubing, terminal blocks, terminals, wire duct, and markers & marking systems. Powertech Controls is proud to offer the following products as part of our Wire, Cable & Interconnect Accessories division. More often than not, the terms wire and cable are used to describe the same thing, but they are actually quite different. Wire is a single electrical conductor, whereas a cable is a group of wires swathed in sheathing. The term cable originally referred to a nautical line of multiple ropes used to anchor ships, and in an electrical context, cables (like wires) are used to carry electrical currents. Whether indoors or outdoors, proper wire and cable installation is of paramount importance - ensuring a smooth electricity supply, as well as passing electrical inspections. Each wire and cable needs to be installed carefully, from the fuse box to the outlets, fixtures and appliances. The National Electrical Code (NEC) and Local Building Codes regulate the manner of installation and the types of wires and cables for various electrical applications.